When our ancestors first began to leave the "Garden of Eden" or Africa, a star passed near our Solar System about 70,000 years ago. 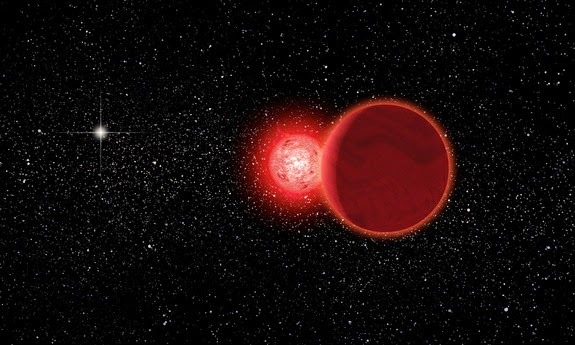 Astronomers at the University of Rochester claim in a new study that Scholz's star along with a brown dwarf flew by the edge of the Solar System in the Oort Cloud. The star's gravity is so weak that it had little effect on nearby comets. It is believed that Scholz's star was about 0.8 light years from the Sun. It is now long gone at about 20 light years away. The European Souther Observatory used Scholz's star's radial velocity using Doppler shift which is a way of detecting the speed of light spectrums in relation to the rest of space. With this method, scientist Valentin Ivanov determined that Scholz's star did, in fact, pass by our Solar System and that it is moving away from it at an extraordinary speed at about 55 miles a second. Scholz's star is considered a rogue star since it is moving through space without and gravitational hold in one location. However, some questions still remain. Why did it fly by our Solar System? What caused it to form this trajectory? Where did it originate from? As to why it passed by - - - now that we're collecting data on many - probably most - stars in this part of the galaxy, it looks like a flyby through the Oort cloud happens every 100,000 years or so. Closer approaches happen every few million years. On a practical level, this happens because we're not orbiting the only star in the galaxy - - - let alone universe.